Hello friends! Good news - we have just returned from the ISS in Orlando (that is the Imprinted Sportswear Show - trade show for embroidery and screenprinting basically) and are happy to report that we have a THIRD machine! What does this mean for you? Well, if you need something 'on the spot' - there is a greater chance of that happening with us having so many machines. Its allllll about you, our wonderful customers! The contractors are finished with the building and the alarm is being installed today so we are preparing to move the last of our equipment in and as soon as we have the last of our inspections we'll be open for business! 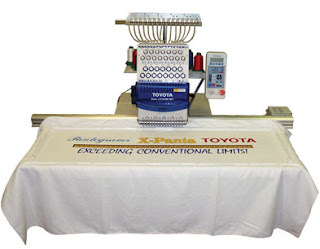 All of us at Pantograms are excited for you with your new Toyota ESP 9100 embroidery system, and we look forward participating in the success of your business!